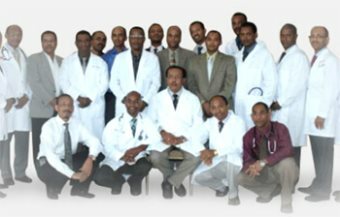 AFRICANGLOBE – A group of 150 Ethiopian doctors living abroad are constructing a hospital in their home country that will offer state-of-the-art medical treatment. This new hospital is designed to reduce the number of Ethiopians seeking medical facilities abroad. The Ethio-American Doctors Group , an association of more than150 Ethiopian doctors in the diaspora, is realizing its dream: establishing an up-to-date hospital in their homeland that includes a medical school and a medical research center. Dr. Yonas Legessa Cherinet of the Doctors Group said the new hospital will feature 27 medical specialties that currently are not offered in Ethiopia. “There are a varieties of fields where service is very limited here. I could mention vascular surgery, urology, pulmonology, neuro-surgery and reproductive endocrinology, which is not available. So many doctors are coming in with so many specialities, there will be a core group of these specialists who will be coming here to lead some departments, to work here,” said Yonas. The Doctors Group hopes that fewer Ethiopians will go abroad for medical help if they can be treated inside the country. Currently, many Ethiopians that can afford better treatment go to Asia, the Middle East and South Africa. The Bangkok Hospital in Thailand treated more than 6,000 Ethiopians in 2011 alone. A lot of money is involved, as the average treatment costs about $20,000. Dr. Zelelam Abebe, who works in a private clinic in Ethiopia’s capital, Addis Ababa, said there is a large need for first-class medical services in the country. “I had to refer several people to hospitals abroad for different cardiac surgeries, brain surgery and advanced cancer cases,” he said. Dr. Yonas said that providing for Ethiopians who might otherwise go abroad means the hospital will have to be run differently – and better – compared to most other facilities in the country. “The reasons they mention [for going abroad] vary from the quality of care to the way they are treated in respect. So we want to bring a new culture here of medical care, which will be patient-centered,” said Yonas. But with an average yearly income of $1,200, most Ethiopians will not be able to afford the treatments offered at the new facility. Yonas said money will be raised for those in financial need. ”We also have what we call the EDG fund, which will be taking 10 percent of our profit for people who cannot afford quality service,” he said. Tariku Assefa is a general practicing doctor who works at the Black Lion Hospital, the largest hospital in Ethiopia, which also includes a medical school. He welcomes the idea of the new hospital, but hopes the new research facility will focus on diseases prevalent in Ethiopia. “We use most of the research that were done in the western countries. We take example from America or other western countries because those research is done there. In most of the disease entity we don’t have our own figures, we use the figures of other people, which is somehow biased because the one which is in the West may not work for us,” said Tariku. The hospital is scheduled to open its doors by 2016 and employ 300 to 400 people, of whom 50 will be physicians. Some doctors from the diaspora will return to Ethiopia, while others will commit several weeks per year to an exchange of knowledge with the hospital.